The road trip is an American institution. At some point (usually in the rebellious teens or while at college), Americans feel the urge to get in a car and drive vast distances. 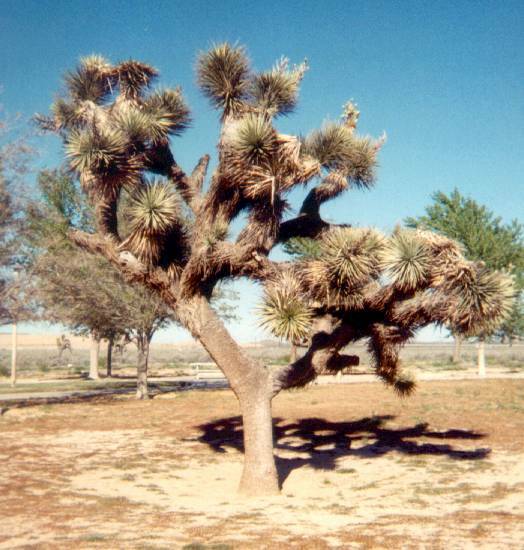 Some leave it later in life, take their retirement money and buy an RV (Recreational Vehicle - a fancy way of saying a mobile home), and spend the rest of their life wandering the deserts of the southern states. Having now seen some of the deserts, I can see why they do it. My trip began when I got a late entry accepted for the Arizona Cup, an archery tournament, which was to be held in Tucson. I had gone to the Arizona Cup the previous year, flying in to Phoenix and driving down to Tucson. On that quick trip I was struck by the desert and wanted a longer time to stop and explore. Coming from a small country with no wide-open spaces (Scotland), the amazing isolation and desolation of the desert was a new experience to me. This year I decided to take some extra time as holiday and drive to Tucson from San Francisco, stopping to look at some of the places that I'd only seen before as pictures in National Geographic. Tuesday, 31st March 1998. San Francisco-Folsom. I picked up my rental car at about 6pm after work; my own car had given up working the day before, and wasn't suitable for the trip anyway. Apart from having 200,000 miles on it, it had been neglected, had no air conditioning or cruise control, and was noisy and uncomfortable. I wanted to get a start on the trip this evening, since I would have a very long drive the next day, and might also possibly have weather-related problems crossing the Sierra Nevada. I drove up to Folsom to visit an old friend from Cambridge, John, and his fiance Alison, stopping at Berkeley to borrow some snow chains from another friend. The traffic was light, so I got up to Folsom in time for us to go out for dinner and a drink. John had to go back into work to finish off a project, while I went to bed. This initial leg was 146 miles. Wednesday, 1st April 1998. 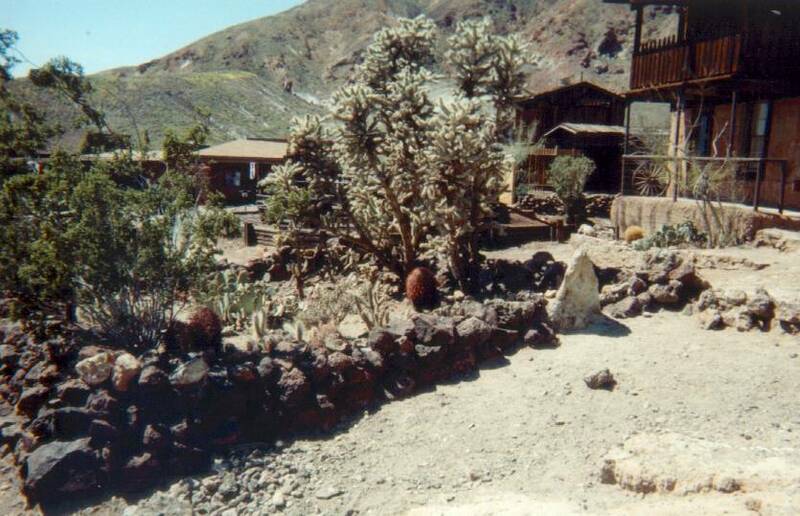 Folsom-Furnace Creek. I got up quite early, and checked the road conditions for highways I-80 and I-50 over the Sierras. I-50 had a chain restriction, I-80 was clear. After a little pondering, I decided to go by I-50 anyway; going by I-80 would add some extra time to the journey even if it was clear. In preparation, I took out the snow chains and worked out how to fit them, and layed out my warm clothes and gloves ready in case I had to stop. As I drove up into the Sierras, the visibility deteriorated, and I got a bit more worried about getting across. I was monitoring the traffic information frequencies and heard that I had made the right choice accidentally; there was a multiple vehicle accident on I-80 which was expected to take several hours to clear. The visibility was poor, but the road surface was alright, so I carried on. Eventually, I did arrive at a chain restriction station, so it was out with the gloves and scarves, and try to fit the chains again. It was much easier in Folsom, where it wasn't so cold! I fitted the chains and drove up to the check station, where I stopped to tighten them. As I did so, I overheard on the radio that the chain restriction had been lifted, so I took the chains off again. Fortunately, they come off a lot easier than they go on! Visibility on I-50 was poor because of light snow showers, so I briefly stopped at South Lake Tahoe to pick up some provisions for lunch and then drove on. I had flown into South Lake Tahoe a few months earlier while doing a mountain flying checkout, but hadn't had time to stop. What was visible from the road did not justify the reputation for beauty that it has; flying in it is far prettier. The visibility did not improve until I was well on my way south down I-395. I passed by some places I would like to visit, such as Brodie ghost town, because the roads were closed. I had driven over Tioga pass and back through Sonora pass the previous autumn, it was nice to see the country around Mono Lake in a different season (even if I couldn't see the lake itself because of low cloud). The visibility finally started to improve down the Owens valley, so I stopped a couple of times to take photos of snow-clad and cloud-covered Mount Whitney. This is the highest point in the contiguous 48 states, at 14,494 feet above sea level. At Lone Pine I turned East along highway 136, joining up with highway 190 on the way into Death Valley. 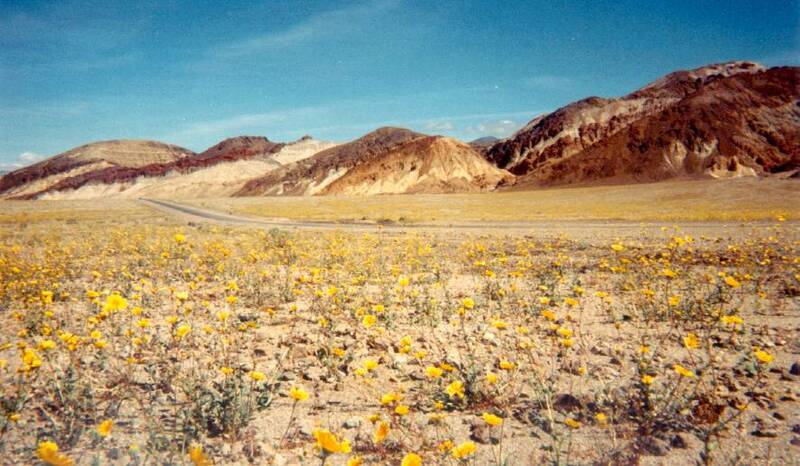 I stopped more and more often to take photos and gawp at the scenery as I approached Death Valley. 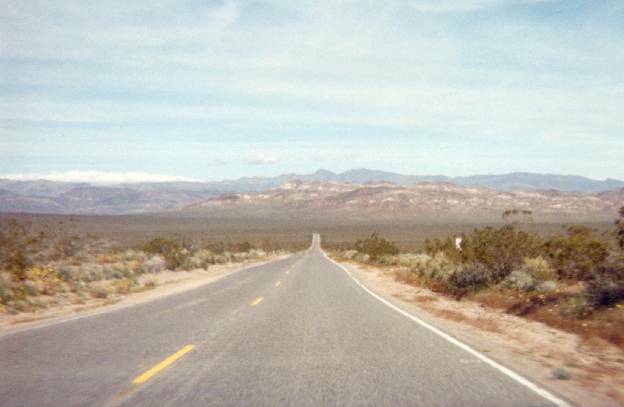 Unfortunately, there was no accomodation left in Stovepipe Wells, so I filled up with fuel and carried on towards Furnace Creek. I didn't get very far before I was out of the car again, walking across the desert floor to get to some sand dunes. The dunes didn't look very far from the car, but as I walked towards them it became obvious they were bigger than I'd thought, and were actually a mile or two from the road. The distances that one can see for in the deserts are stunning to someone from a small country. Later in the trip I was able to get views that covered more ground than the distance between both coasts of Scotland! Death Valley has amazing contrasts in it; you can stand with sand dunes all around and look up at snow-covered mountains only a few miles away. I found the name ``Death'' Valley highly inappropriate too; at this time of year it was teeming with life, from the carpets of wildflowers to the lizards and insects. After wandering about the dunes for a while, I headed back to the car and carried on towards Furnace Creek. I was probably a bit over-zealous to get there, since I knew there might not be accomodation for another 30 or 40 miles after that, and I had managed to miss a speed limit sign post on the way into the valley. Whatever the reason, I shortly had flashing lights in my mirror, and pulled in to wait for the policeman who had stopped me. I'm not sure if my accent convinced him it wasn't worth the trouble of booking me, but I was fortunate to get away with a warning. I made sure I watched my speed much more carefully from then on. 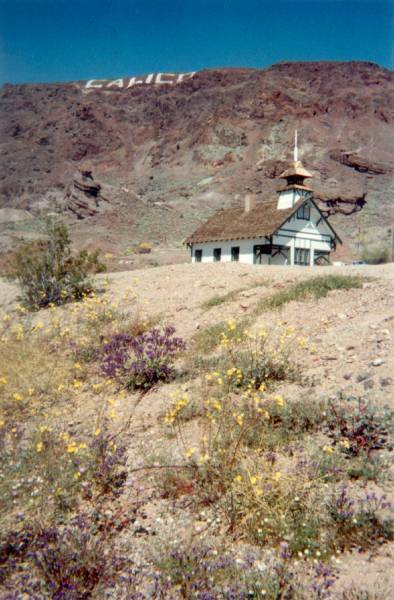 At Furnace Creek Ranch, I managed to get a cabin to stay the night. I noticed they had an open-air swimming pool, so I went for a swim under the stars. The pool is heated by a hot spring, they just pump the water straight from the ground through the pool. It was really nice to be able to lie on my back in the pool, looking up at the stars. After dinner at the steakhouse, I drove out into the desert and lay looking up at the stars for a few hours. The seeing was good, but a near-full moon above the horizon blotted out a lot of the stars. Even so, I saw many shooting stars, and made many wishes (none of which have yet come true). Furnace Creek is located at 190 feet below sea level; I think this is the only night I have spent below sea level in my life. This second leg was the longest of the trip, at 441 miles for a total of 587 miles. Thursday, 2nd April 1998. Furnace Creek-Las Vegas. In the morning, I went to the visitor centre in Death Valley to see what time the fauna and flora hikes were. The times did not suit me, so I went on my own, driving south through the valley and stopping to hike and take photos at several points. The first stop was Golden Canyon; this was truly superb, a small canyon entrance which lead into a maze of canyons. Thousands of people could get lost in the canyons and you would never know. The peace and quiet up in the furthest canyons was wonderful. There was virtually no noise, except for the occasional bird. 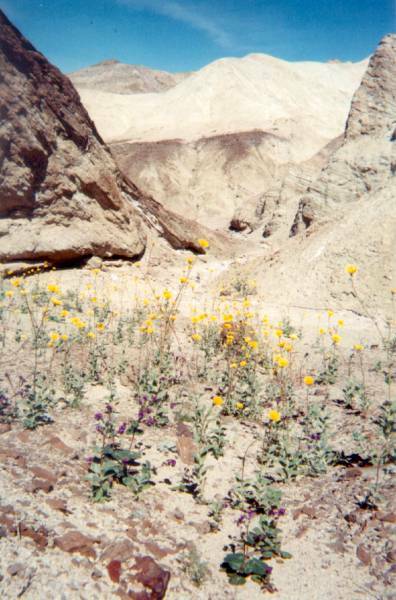 The canyon is mostly bare, but there are occasional patches of flowers, growing on the sides of canyon with apparently nothing to sustain them. After Golden Canyon came the Devil's Golf Course. 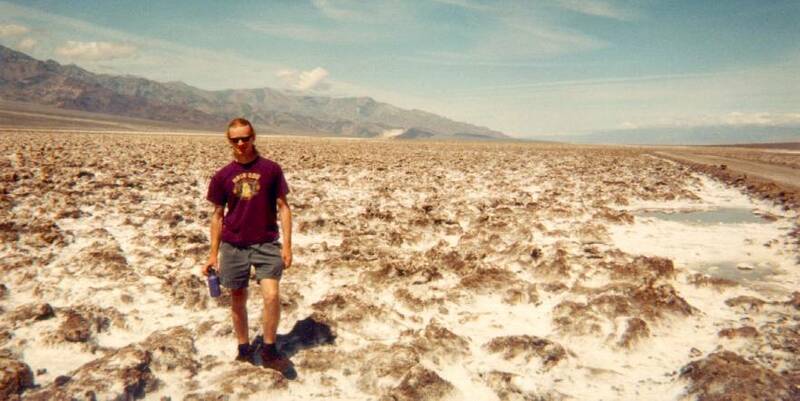 This was more like the image of Death Valley that I had; a wasteland of salt piles, with nothing able to grow. Even here, I found it beautiful, looking at the flat desert floor rising precipitously more than 11,000 feet to Telescope Peak. The Natural Bridge canyon was next, another hike off the road up into a canyon, with some impressive geological formations. The colours of the hills around the canyons were amazing, a beautiful collection of browns, reds, yellows, blacks and greens, with the yellow of the spring flowers bringing it all out. 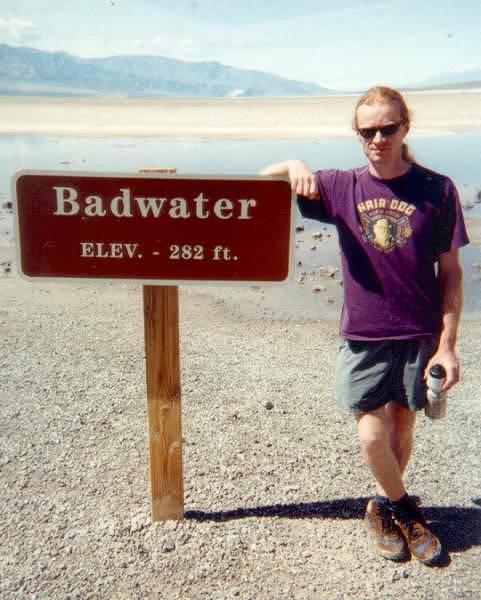 After an obligatory stop to take a photo next to Badwater, at -282 feet the lowest point in the western hemisphere, I carried on south down highway 178 through the valley. I nearly fell asleep during a stop at Mormon Point, the warm sun, hiking and long drive conspiring to make me tired. I was woken by a sonic boom, to be reminded that just over the Panamint range is China Lake, a naval air weapons station. Coming out of the valley, I kept on highway 178, joining 372 just before it crossed into Nevada and then 160 at Pahrump. (I nearly stopped here to take a photo of a sign saying that the next 2 miles of highway cleanup was sponsored by The Loyal Order of the Moose, Pahrump! It did say that, honest!) Turning south on 160 took me to Las Vegas, where I would stop for the night. After the desert, what can one say about Las Vegas? It is brash, trash, and tacky, and the best thing to do with it would be to bulldoze the whole thing and let the desert reclaim it. I came in via Las Vegas Boulevard, ``The Strip'', and marvelled that anyone would have the hubris to build the pyramids and palaces that are used for casinos. I located an archery range in Las Vegas and went there to try to tune some new equipment. After a less than satisfactory time (I couldn't shoot more than 10 yards because a group of girl scouts were getting an introductory lesson), I went out for a night on the town. After dinner I wandered through the casinos, watching gamblers losing money to big business. I had taken some money to spend myself, but very quickly got bored of seeing it vanish into slot machines. I watched the card, craps and roulette tables, but not understanding the rules didn't bet on them. The only pause for thought I had was watching a gambler winning some chips playing BlackJack, which I discovered were worth $100 each when he cashed them in. This day's driving was only 173 miles, for a total of 760 miles. Friday, 3rd April 1998. Las Vegas-Tucson. I was glad to be leaving Las Vegas early. I stopped briefly at for fuel in Boulder City, and then at the Hoover Dam for photos, but couldn't get a good view. I headed down highway 93 into Arizona, along I-40 for a short stretch, and then down highway 93 again, joining highway 60 before Phoenix and then down I-10 to Tucson. 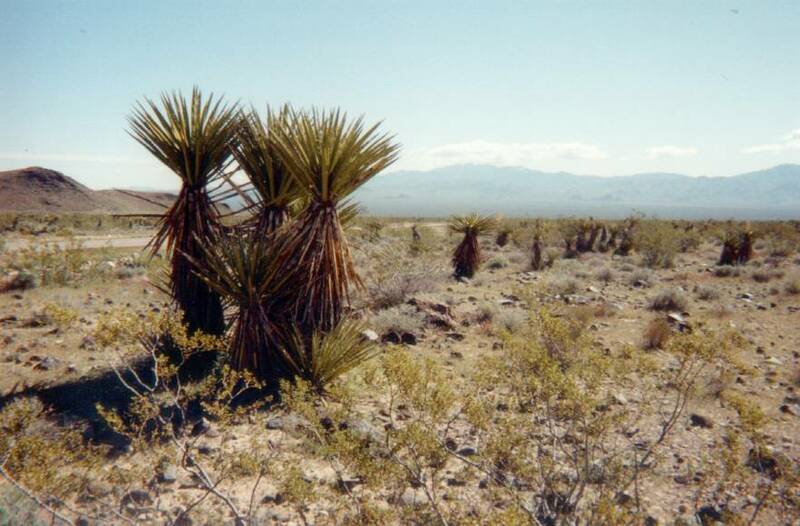 The section between Kingman and Wickenburg became very scenic, through a Joshua Tree forest. I wish I'd stopped for more time and to take photos, but I wanted to arrive in Tucson before the archery field closed for practice. The leg to Tucson was 390 miles, for a total of 1150 miles. Saturday, 4th April 1998. Tucson. This was the first day of the archery tournament. The longer two distances (90 metres and 70 metres) were shot this day, with the 50 and 30 metre distances on Sunday. I started out poorly, with my first practice arrows missing the target altogether. This wasn't too surprising, I had broken one of my rules and changed equipment just before the competition. What was surprising to me was how far I had to move the sight to get back on the target. Throughout the day, I felt that I was shooting good shots but not getting the results I should have. I had a clearance problem with my sight at 90m which took some time to diagnose and then fix, but I didn't get the results I knew I should be getting for 70m either. The day also saw another classic Jay Barrs joke. Jay is quite a character, as well as being an Olympic Gold medalist. The leader board at the start of the day showed a gentleman called ``Meoff'' leading by quite a way, shooting near world-record scores. A lot of people were asking around, trying to find out who he was and where he was from, since nobody had heard of him. It turns out that his first name was ``Jack'', and he was shooting on the same target as Jay...in case you haven't twigged yet, ``Jack Meoff'' was a ficticious archer that Jay had made up, since there were five spaces on the running scoresheet and only four archers on the target. The organisers took it in good spirit, even though one of them spent a couple of hours that night searching for a non-existant scorecard! Sunday, 5th April 1998. Tucson. The second day of the tournament was just as frustrating for me as the first; my sightmarks were nowhere near the practice marks, and I couldn't seem to get a group. I also wasn't helped by having to shoot my first end at 30 metres on my own in front of the whole crowd. This transpired because we were shooting the multiple spot 30m target faces, and Juan Wedel from Costa Rica accidentally shot his arrows on my target. I felt bad for Juan, because he shot three perfect inner tens, which would have put him in fourth position in the compound division. Even so, 1323 with three misses is not bad! After the qualifying tournament was over, I got Don Rabska to take a quick look over my bow. He suggested some things I could try to re-tune the equipment, so I spent some time that evening making changes and testing them. I was glad they cut the field for the elimination round at 64, because I shot so poorly during the previous two days that I wouldn't have made a 32 cut. Monday, 6th April 1998. Tucson-Grand Canyon. I spent the morning shooting and watching elimination matches. Since this was a World ranking tournament, winning matches meant gaining ranking points. My changes the previous night had helped, I was shooting better scores than the previous days. In the first round, I came against Chris Jones, who I had been out to dinner with the previous three nights! We were both shooting alright in practice, but both shot poorly in the first round. Fortunately for me, I shot a little bit better and scraped through the match. In the second round I shot against Rick McKinney, three-times world champion and twice Olympic silver medalist. After the first end, we were tied. I had a couple of weak shots in the second end, and Rick opened up a lead. I recovered in the third end, but Rick held his lead to win the match. I could have sworn that some of Rick's shots should have missed; he was exploding in all directions, but when I looked, the arrow would be in the gold. As always, it was a pleasure shooting with and talking with Rick. After getting eliminated, I stayed to watch the end of the Olympic style competition. The eventual winners were Butch Johnson (USA), Christoph Peignois (Belgium) and Frank Govaerts (Belgium) for the men's tournament, and Natalie Nazaridze (Turkey), C. Labreque (Canada) and Janet Dykman (USA) in the women's. Highlights for me included watching Lorna Eley of England beat some big names and getting mugshots of some of the best archers for my web pages. The travel to and from the archery field had added 30 miles to the total, which was now 1180 miles. I now wanted to get up to Grand Canyon, so that I could spend some time looking at it on Tuesday before I would have to start for home. I went north through Phoenix on I-10, then to Flagstaff on I-17. I had left the hot desert of southern Arizona wearing shorts and a T-shirt, when I stopped at Munds Peak for fuel I had to get some more clothes on quickly, it was snowing! I missed the opportunity of stopping to look and photograph the cactii in the desert, which I regret; it is such a different landscape to those I grew up with that I would like some reminder of it. I couldn't get accomodation in Grand Canyon Village as it was full up, but found a room in Tusayan, just outside the canyon. It was snowing quite heavily when I arrived there. 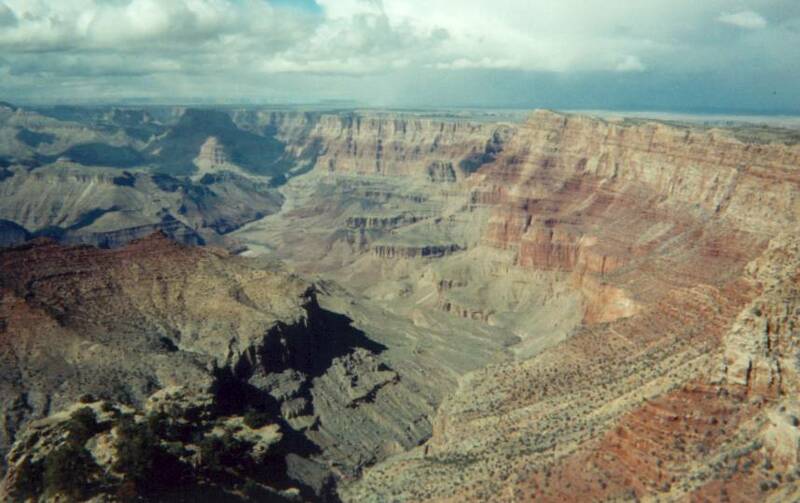 The trip to Grand Canyon was 334 miles, for a total of 1514 miles. Tuesday, 7th April 1998. 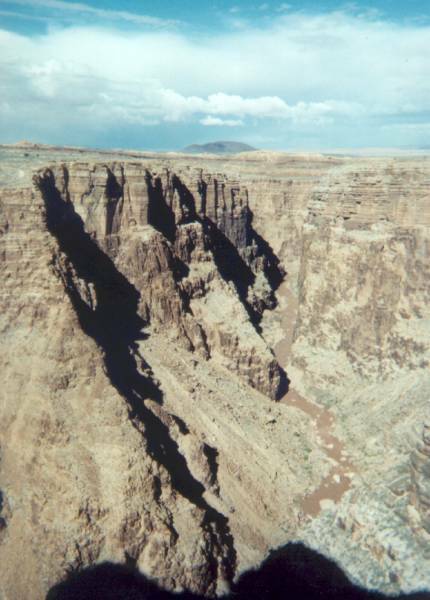 Grand Canyon-Kingman. 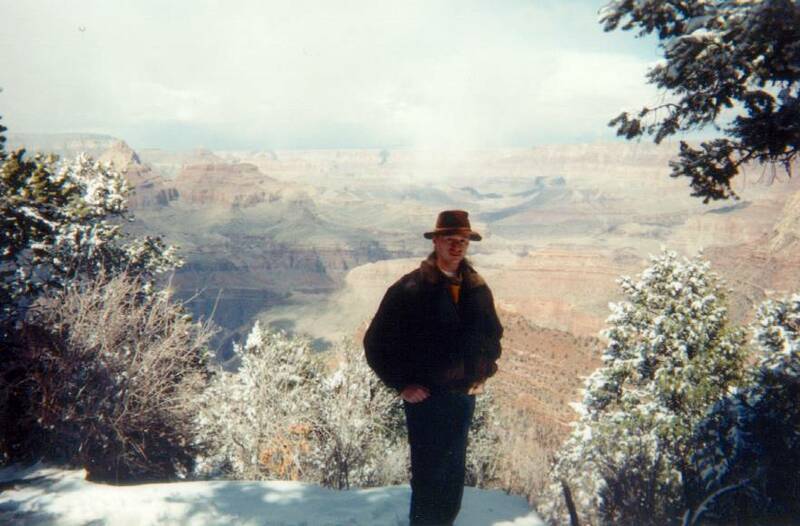 I spent the morning hiking along the Grand Canyon rim trail, which was quite quiet because of the snow; most of the tourists were taking the shuttle busses between viewpoints. The weather was opening up between snow showers to show startling views across the canyon, or rainbows down into the canyon, and then closing down to nothing but grey cloud and snow. In the afternoon as I drove along the East Rim drive the weather opened up, and the scale and colours of the canyon became apparent. It really was very overwhelming. At points the view could be measured in hundreds of miles. I really don't think one can get a good impression of the canyon from the rim; to do that would require an overnight hike down into it. I did go a short way down the Bright Angel trail, but didn't have time to pursue it further. The drive back down route 89 and then across I-40 until I stopped in Kingman was nice, but a bit of a let-down after the Grand Canyon. Kingman was the home of Andy Devine, and they seem very proud about it. Who's Andy Devine, you may ask? So did I. Andy Devine was an early silent screen actor and comedian who became famous as someone's sidekick (I can't remember now). He came from Kingman, and lived there even during his best known periods in Hollywood. They have an Andy Devine street and an Andy Devine parade day in Kingman. This leg was 286 miles, for a total of 1800 miles. Wednesday, 8th April 1998. Kingman-Tulare. From Kingman, I followed historic Route 66 down to Golden Shores, on the California border. This section of road was very scenic; a winding road through hills, old western towns with boardwalks, deserts with cactii and Joshua Trees, through dry wadis. I stopped in Tulare that night with Chris Jones (who I had beaten in the Arizona cup elimination round) and his wife Robin. The second last leg of my trip was 425 miles, for a total of 2225 miles. Thursday, 9th April 1998. Tulare-San Francisco. I spent the first part of the morning shooting with Chris, while he tried out my 40lb bow limbs and I tried one of his PSE bows with my stabilisers to see if I liked it. We both got good value out of trying each other's equipment; Chris will be getting new limbs, I won't be getting a PSE. The drive back to San Francisco from Tulare I have done many times before, the roads are rather monotonous. The best part was stopping at Harris Ranch for lunch, and having their very nice Tri-Tip steak sandwich. The journey home was 255 miles, a grand total of 2480 miles in 10 days.